The NES Classic Is Dead, But Why Did It Even Exist In The First Place? — GamingWithSwag.com - Dads By Day, Gamers By Night. Apr 17 The NES Classic Is Dead, But Why Did It Even Exist In The First Place? With the recent news of the highly coveted NES Classic being discontinued at the end of this month, Nintendo has felt some consumer backlash due to supplies being very limited since launch. 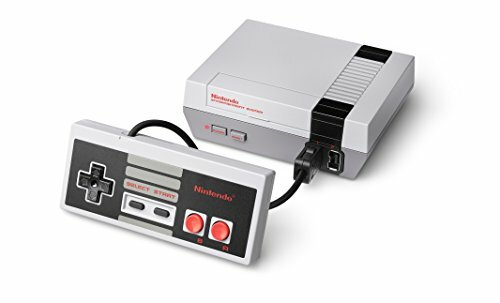 Retailing at $59.99, the NES Classic was priced at a perfect holiday gift price point, guaranteed to sell out even if it was only a moderate success. I truly believe that the NES Classic system was never intended to be a long-term product in Nintendo's catalog. Let's examine the scenario Nintendo was in starting in early 2016. Rumors of the Nintendo NX (Nintendo Switch) being announced at E3 2016 were swirling around the journalistic circles, which seemed like a sure fire thing that they would be primed to release the system for a spectacular Holiday 2016 retail season. However, as we now know, that never happened. I speculate that the big N had full intentions of a giant Nintendo Switch presentation at last year's E3, but the system wasn't ready for primetime. With the WiiU basically dying, Nintendo had only one must-have title for the upcoming holiday season to show, Pokemon Sub/Moon. Most likely the NES Classic was a pet side project of someone in the company, and Nintendo saw an opportunity to appease investors and not underperform for the Q4 earnings report. By spending almost zero dollars on R&D, if Nintendo could find a way to mass produce the emulation box and acquire licenses for hit games for next to nothing, then it would automatically be profitable even if it wasn't super popular. There is a reason why certain games aren't on the system, and it is not technical. Tecmo Super Bowl is a prime example, paying the rights to the NFL and NFLPA to reacquire all of the names and franchises would become cost prohibitive. The same goes for familiar licenses like DuckTales, Teenage Mutant Ninja Turtles, and Rescue Rangers. The NES Classic was never intended to be a long-term product. Nintendo needed something for the 2016 holiday season, and the NES Classic did the job. Paying $2 a game for 30 games is an incredible deal for the consumer, considering most NES games cost around $5 on the Nintendo eShop. Nintendo has to reduce the production of the NES Classic to focus on the future, and that's a good thing. There is currently an incredible demand for Nintendo Switch and various accessories that have been sold out, some since launch last month. Nintendo has to get these manufactured and out to the public to satisfy demand as soon as possible. I feel that a Nintendo eShop for the Nintendo Switch system is going to be announced soon, and that hopefully will satisify the retro demand that is currently present in the industry. I also seem to think we have not heard the last of these type of products from Nintendo either. There is always a possibility of a Super Nintendo version or Nintendo 64 to cash in on nostalgia if they hit another drought in their release schedule. Stay tuned for more info as it is released up to E3 2017 this year. Dec 19 Nintendo is Magically Supplying NES Minis for Dec. 20th, Just Like the Wii in 2006.